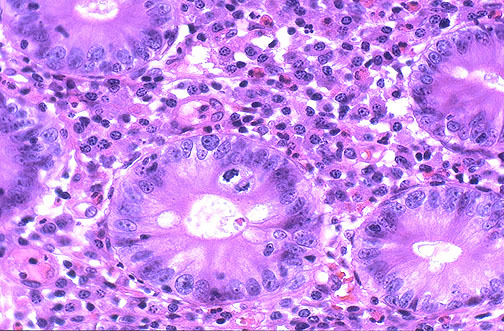 The small intestinal mucosa at high magnification shows marked chronic inflammation in a case of celiac disease (sprue). The enteropathy shown here has loss of crypts, increased mitotic activity, loss of brush border, and infiltration with lymphocytes and plasma cells (B-cells sensitized to gliaden). The most common symptoms and signs include chronic diarrhea, often with foul smelling stools (steatorrhea), abdominal bloating and cramps, and flatulence. When asked about the nature of the diarrhea, a patient may recount having 8 to 12 stools a day, sometimes 2 to 5 times per week. The stools are watery but not bloody. The malnutrition can lead to weight loss. Poor absorption of nutrients such as iron, calcium, and fat soluble vitamins can predispose to anemia with fatigue (iron, vitamin E), osteopenia (calcium and vitamin D), bleeding (vitamin K), and increased infections (vitamin A). These findings may not be severe, and may develop over years to decades. Removing foods containing grains with gluten from the diet will cause this gluten-sensitive enteropathy to subside. Decreasing intake of fats and milk products can help as well.